Helinox Beach Chair. The ultimate in summertime comfort is here. 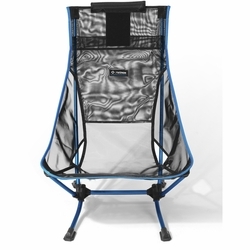 The Beach Chair with Mesh combines the ultra-comfy laid back design of the original Beach Chair and adds a mesh seat that will keep the cool beachy breeze on your back while the sand warms your toes. Like the original, this Beach Chair packs down small and is the perfect summertime companion for campfires, patios, river beaches, or anywhere you want to rest your tired paws.